Wheat, lentils, garlic, apples, goldfish - what are you thankful for? Not only is today the first day of Spring, today is Norooz, the Persian New Year. As an Iranian American woman, I am very proud to say that I celebrate the Persian New Year. As today is the first day of the March equinox, the origin of Norooz comes from the mythical Persian King, Jamshid who rightfully saved all of humanity by defeating Winter. Jamshid constructed a throne made out of gemstones where he had demons raise him above the earth, into the heavens where he sat shining ever so brightly like the sun. The entire world gathered around Jamshid, proclaiming that this was the first day of "Nowruz" or New Day. Norooz's origin comes from Zoroastrianism and Mithraism. Spring cleaning and shopping are both two major activities Persians utilize before preparing for the new year. A clean house is highly auspicious. Decorating is also a must. And buying yourself a beautiful outfit represents change. In addition to cleaning and shopping, Persians are expected to make short visits to family and friends. Often times elders are visited first. Food is heavily embraced, as Persian tea, pastries and cookies are often served. Dried fruits are also part of this lifelong tradition. Upon arrival of the Persian New Year, a haft sin table is prepared, as this table is deeply rooted with immense symbolism. A traditional haft sin table consists of Sabze, Samanu, Sumac, Vinegar, Apple, Garlic and Persian Olives. Additionally, it also includes a mirror, candles, eggs, coins, goldish and hyacinth as well as the traditional Persian sweets. A book of wisdom, primarily one of faith (Bible, Avesta, Quran, etc.) may also be placed on the haft sin table. The sun, the moon, the star, the heart, the eye, the life. Today I am thankful, blessed, honored and grateful for everything in life. A new dawn, a new day, a new noon, a new sun, a new eve, a new night, a new sky, a new life. Nowruz Mobarak! Happy Norooz! As many of you know, I am Iranian American. As I am quite proud of my Persian heritage and culture, I love to celebrate the Persian New Year (Norooz) every year. Well tomorrow is Norooz As the most highly anticipated holiday of the year, Norooz is a holiday that equalizes both night and day, bringing you more than just a new dawn and a new life, but a new day. In fact, the Persian word "Nowruz" means new day. As the first day of Farvardin, it is also the first day of the March equinox and the first day of the Iranian Solar calendar. To celebrate the holiday, Spring cleaning is essential as it symbolizes a "rebirth" of your environment. 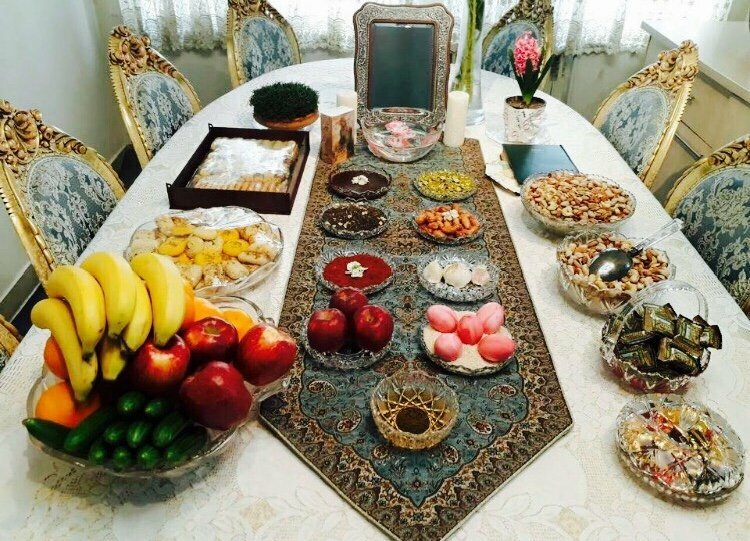 And for the Persian New Year, a "Haft Sin" table is set up which consists of Sabze, Samanu, Senjed, Serke, Sib, Sir, and Somaq. The items all include some sort of plant and/or food to represent them, which correlate with the planets in our universe. Sabze includes grains such as barley, wheat, or lentil sprouts grown in a pot or a dish. The Samanu utilizes sweet pudding (usually made with wheat germ). Senjed is represented with olives, usually Persian olives. Serke uses vinegar. When it comes to representing Sib, apples are used. Sir is represented by garlic. And last, but not least the Somaq uses sumac. And for every Persian New Year, this is the kind of things you will see on a traditional haft-sin table. Other things you will see on the table include: a living gold fish in a bowl, candles, a mirror, colored eggs, hyacinth, and other random decorations. Creativity is usually embraced, as not every haft-sin table looks the same nor are they created equal. A book of faith (some refer to this as a book of wisdom) is also added. As most Iranians are Muslim and embrace Islam, there are many (like myself) that are not Muslim, so I would not include a Quran at my haft-sin table. Various food is prepared, primarily Persian dishes. Each day there is a new dish, as several are prepared per day. As most are non-vegetarian, I usually create these dishes using a plant-based alternative or if I am eating dinner with family, I request a vegetarian alternative to the dish. Most of the Persian sweets or desserts are vegetarian. When I am not eating baklava, consuming Persian tea, I love to enjoy dolma stuffed with rice and veggies, kuku sabzi (an amazing vegetarian-friendly Persian dish which utilizes various herbs and veggies), and sabzi polow (rice cooked with an variety of herbs as well as, noodles). Most of the time sabzi polow is served with fish, but I eat it alone or with Gardein's fishless filets. I am looking forward to celebrating Norooz this year with family and friends. It is a time to both reminisce and relax. Although many enjoy celebrating before the holiday, the holiday continues days after. Enjoying great Persian food with Persian music and laughter, there is just nothing better. Happy Norooz! Sale no mobarak! نوروزتان مبارک! من بهترین ها را برای شما آرزو می کنم!